The SIM928 Isolated Voltage Source is ideal for applications where ultra-clean DC voltage is required. Voltage can be set between ±20 VDC with millivolt resolution, and the source can drive up to ±10 mA. The output circuit is optically isolated from all earth-referenced charging circuitry, providing maximum flexibility and noise immunity. The system can float to ±40 V, and the output is short-circuit protected. At the heart of the SIM928 are two independent nickel-metal-hydride rechargeable batteries, each providing up to 12 hours of operation under full load conditions. When a battery is nearly depleted, the SIM928 automatically switches in a second battery. The switchover between batteries is virtually glitch-free, giving you uninterrupted power around the clock. The depleted battery is automatically charged to capacity in about 5 hours. The batteries are guaranteed for 1000 charging cycles, and SRS offers replacement battery sets. In applications that occur over long time intervals, starting with a fully charged battery may be desirable. A battery charge override feature allows you to manually switch in the fully charged battery (assuming it is in ready state) at any time. Banana binding posts are provided for the + terminal, - terminal and chassis ground. Battery switching Automatically switches batteries when active battery is fully discharged. 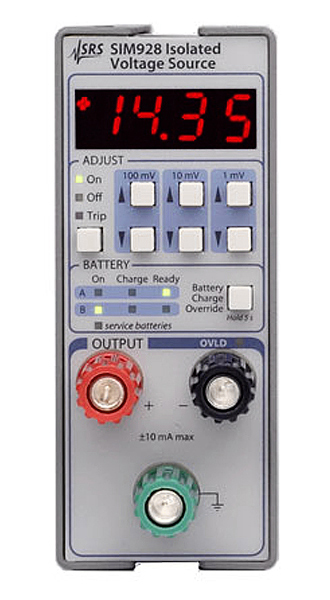 Battery charge override Allows manual switching of batteries. Triggered when front-panel button is held for 5 seconds or more. Only armed when standby battery is in ready state.